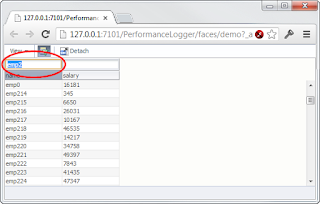 This post will show how to use the ADF Logger for performance analysis and how to instrument your own code so it shows up in this analysis. 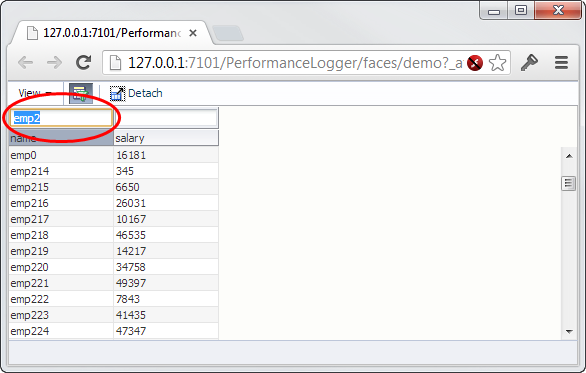 Every ADF developer should know, or learn, about the ADF Logger. If you are new to the logger than read up on it at the official documentation or the great Adventures in Logging series by Duncan Mills. 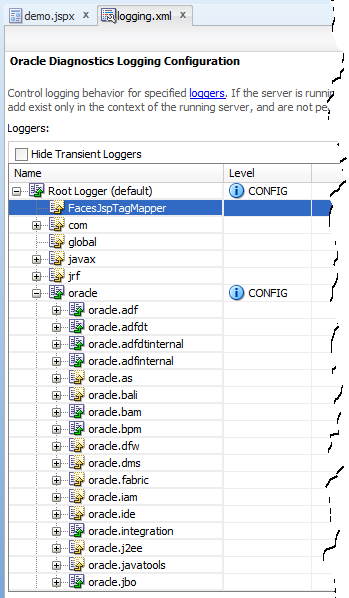 All the logging for performance diagnostics is done at the CONFIG level so be sure to set the Root logger and Oracle logger to CONFIG. 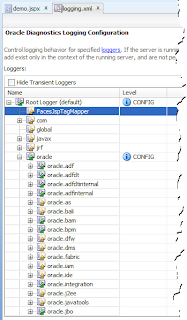 While developing you might even want to crank up the levels for oracle.adf, oracle.adfinternal and oracle.jbo to FINEST but be aware that this will show a lot more logging which has a performance impact of its own. From the logging we can see that the employees are fetched again. This might be a surprise since the page had already retrieved the list of employees from the bean datacontrol. Why would filtering need to request the data from the data control again? When we experience bad performance in an application it would be nice if we can quickly analyze the logs and discover where time is spent. We can now inspect individual requests and drill down in the separate phases. We can quickly see our fetchEmployees method was executed in this last request and it took 2973 milliseconds to complete. The key to making this work is to invoke ADFLogger::begin and ADFLogger::end in your code. You should do this before and after any code that can be time consuming, for example requesting a URL, invoking a webservice, very expensive calculations, interacting with the file system, etcetera. 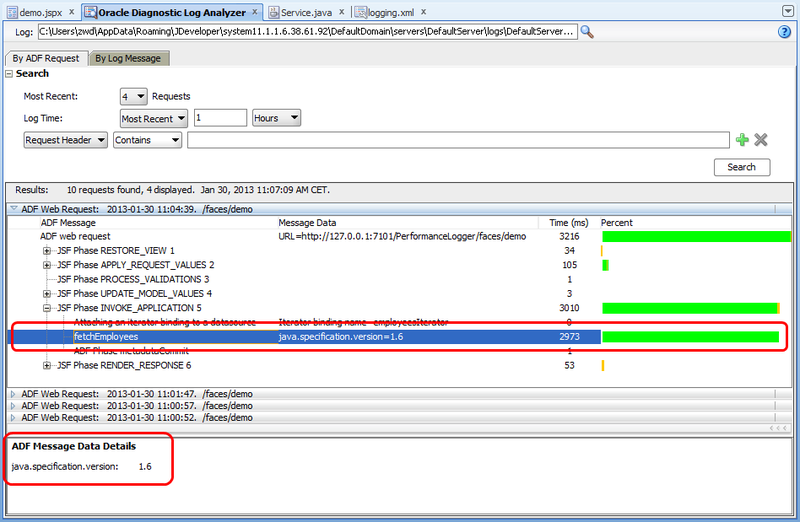 One other nice feature about Oracle Diagnostic Logging is that you can supply additional context with a log message that will not clutter the default console logging but is available in the more advanced viewers such as the log analyzer. In this example you can see the java.specification.version but in a real application you would typically log information about the resource intensive task such as the URL being retrieved, query being performed or file being read. Unfortunately ADFLogger::begin requires a full blown java.util.HashMap with this context. First of all it is bad practice to require specific classes when the java.util.Map intreface would suffice. But more annoying is that constructing a HashMap can require quite some lines of code which would clutter your java code. For this, I created a utility class that accepts a set of Strings as varargs. The list of strings you supply as arguments are alternating keys and values hence the requirement for an even number of parameters. You can download the full sample application or browse the subversion repository to look at the source code. 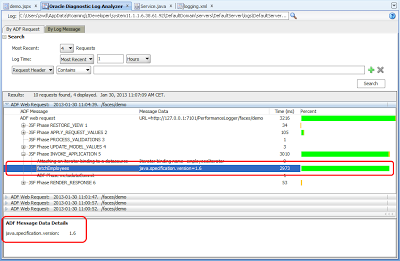 When running this application yourself be sure to setup the logging levels of your WebLogic server appropriately.